Babić is Croatian indigineous grape and alongside with Plavac Mali with most potent for producing extraordinay wines. This Babić is softened in barrique barrels has distinct notes of ripe berry fruit with pronounced aromas of cherries with a light touch of spice aromas. The pleasant scent accompanies with strong body, soft ripe tannins and harmonious acid. Wine strong alcohol gives the sensation of heat in the mouth and leaves a long sappy aftertast. 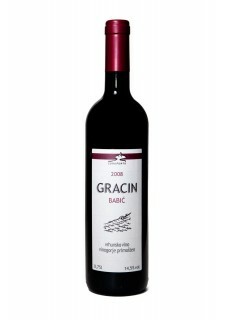 Vineyards of Primosten, one of the more characteristic terroir in the world, has given us another very interesting Babic producing by winery Gracin. Food pairing: Red meat dishes. Our selection is Pasticada. The forerunner of the company was family winery founded in 2000 by Leo Gracin and his father Ante. Ivan Ratković and Lado Skorin joined them as partners and established new firm named Suha punta in 2006. The first babić was released to the market and besides it was declared as the best babić and was also classified among the best red Croatian wines. The person responsible for a genuine and long-term recognition of this excellent variety is definitely enologist dr. Leo Gracin. Generally, babić seems to be a great variety that in good hands apparently is able to reach the most unreachable heights reserved for quality wines like Syrah from Rhone Valley and merlot from St. Emilion. Babić is autochthonous Croatian variety which is still ahead of the final quality range and the potential for aging. Babić is the single grape variety in the wine region of Primošten and it has been like that from the beginnings of viticulture in this area. Wine region is situated in northern Dalmatia, some 25 kilometers east of Šibenik and 60 kilometers west of Split.The components which best describe Primošten terroir include stone, sun, sea, wind, and the name Suha Punta, as the name of this region due to little rainfall during the annual life-cycle. Total vineyard areas is around 50 ha. Picture of Bucavac appellation, the most famous position for babić, which is best described as "stone lace" among the vines grow was in the building of the United Nations as an ode to human labor. Density of plantation ranges between 3 and 7 thousand per hA depending on the soil or, better said, the percentage of stone in it. Vine training technique is goblet (no wires or other system of support involved) with two to three spare canes with two bud. This method of cultivation gives 4-7 clusters but the part of regular harvest usually is lost during June due to strong winds („jugo" and „bura"). Vinery Gracin has vineyards in two locations. One of them is earlier mentioned Bucavac with two vineyards of total 1,3 ha, and the other one is Šljinovac with one vineyard of total 3 ha. The most of the grapes is bought from Primošten growers and mostly from vineyards that are up to 50 years old.